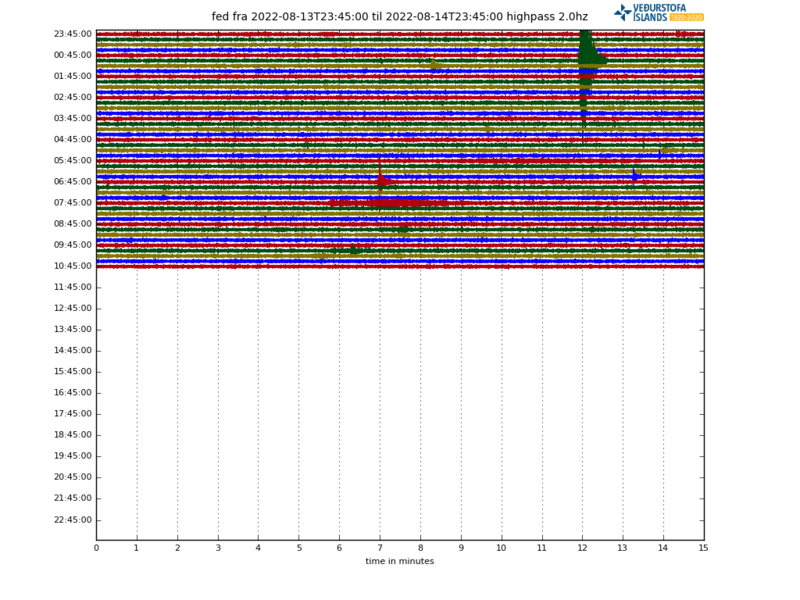 At 07.55.04 Hekla suffered an earthquake of M0.9 at 0.7km depth under the west slope of Hekla proper. After that followed two badly localized small tremors before a second earthquake with a temporary solution of M0.6 at the same place and depth. After that came a final (so far) small tremor. This follows after ten days of GPS changes indicating relaxation of the Heklugjá fissure under Hekla. The earthquakes may therefore be due to resettling of the mountain after relieved pressure. There is also the possibility that this is how a prelude to a Hekla eruption looks like when you have very good instrumentation to watch. Or in other words that Hekla erupts due to tectonic forces pulling the fissure apart that in turn lowers the pressure inside the magma reservoir rapidly releasing volatiles. That would neatly explain why onset of Hekla eruptions are so explosive. Just prior to onset of Hekla eruptions (cirka 10 minutes) there will be very rapid changes registered on the strainmeters as the mountain pulls apart. So far nothing like that has occurred, but look at the image below and you will know roughly what to look for there. If an eruption would start it would have a very violent beginning. It is though good to remember that Hekla had a larger earthquake swarm back in 2013 without any eruption occurring, that being said, if you see a M2+ earthquake and a brief smattering of smaller earthquakes COMBINED with a rapid strain drop at Burfell an eruption could perhaps be on the way. As I write this there are no such signals. The post will be updated if anything interesting happens, if not another post will be published later in the day. The second earthquake comes out as a solution of M0.6 1.4km WNW of Hekla at roughly 1.5km depth when I worked on it manually. We will see what IMO ends up with. FED is an interesting station, it will most likely not survive the onset of eruption, but it will give good details prior to an eruption. At http://www.noodweer.be/druk-neemt-toe-onder-vulkaan-vesuvius/ “Druk neemt toe onder supervulkaan Vesuvius” (Pressure mounts under supervolcano Vesuvius) and http://www.noodweer.be/vulkanisch-gebied-colli-albani-ontwaakt/ “Vulkanisch gebied Colli Albani ontwaakt” (Volcanic district Colli Albani re-awakening) I read that the Colli Albani volcano near Rome in Italy is re-awakening. Use Google Translate to translate these two articles in Dutch to English. First of all, Vesuvius is not a super-volcano. It is a run of the mill ordinary volcano. It is doing what volcanoes do between eruptions and that is getting ready for the next eruption. This goes in fits and spurts, and currently nothing out of the ordinary is happening. Colli Albani is extremely slowly inflating at the dashing speed of 1 millimeter per year. This has probably been going on since Roman days. It is believed that the inflation is due to accumulation of pressurized water in the aquifers and not from magma accumulation. So far this year Italy has been rather unassuming from a volcanic standpoint. Hekla is a complex beast. There seems a bit of a discrepancy between the depth of magma conduit (~6 km) and the depth of the main magma chamber (15 km). The measured inflation seems mainly due tot the deep magma chamber. I suspect that the critical path is in between, 15 – 5km. Perhaps that part can open very quickly. The biggest problem with “Heklology” is that the depth of the chamber is so poorly constrained. Depending on data used the poor chamber moves about from 2 km below the base of the mountain down to 15 km. I prefer the model of a constantly open wedge shaped sill running from the MOHO to 2km depth. The high heat exchange together with the column shape would explain the extreme speed that fractioning occurs at since it would work as an almost perfect natural refinery column. On thing is though entirely certain, it open very quickly. During the last eruption it opened from 8km to the top in 10 minutes. Why are the few small quakes at Hekla so important? Bardy just had a 3+ and there are plenty of quakes all over Iceland. I don’t get it. Hi, The recent behaviour of Hekla shows us that her quake run-up to an eruption is very short, I.e. : couple of quakes, an hour then boom. Of course patterns can change but if she follows the same behaviour as the last eruptions then we could be in for a show. Due to this Hekla is a very dangerous volcano and worthy of our respect. There’s also the small matter of a wager and eating hat’s. Hekla is an orders of magnitude more fickle than Bárdarbunga. Last time it erupted it had a brief smatter of about 10 earthquakes, all of them small prior to eruption. It is also placed closer to habitation and it is extremely explosive during opening stages of an eruption. So much so that it has the world record of killing someone with a lava bomb, a farmer in a field that got decapitated 42 kilometers away. In the end Bárdarbunga and Hekla may be the two perfect examples of why you need to know the history of individual volcanoes intimately to understand why something is very dangerous at one volcano and not at all at another that is close by. Because if Hekla had even one day of Bárdarbunga as it is being festive it would lead to a very large eruption indeed. Hekla is also the Queen of Iceland if ash is counted. Whenever you go in Iceland, Hekla ash is prominent and winner. Hekla accounts for more than half of Icelandic ash, and that´s a lot. Hekla has thrown before some VEI6s (10km3 +), namely in early and mid Holocene. Worst of all, Hekla is from the big Icelandic four (Hekla, Grimsvotn, Katla and Bardarbunga), Hekla is the closest to populated areas and to Reykjavik. Also Hekla has very poisonous Fl-rich ash. The Big Four … on triple junctions at the four corners of a microplate? How many false alarms have happened ? Definitely not an expert, especially in comparison with some of those who’ve posted earlier in this thread, but one of the things that makes Hekla so dangerous is that s/he doesn’t really sound any alarms at all. So you could take what’s been happening today as an alarm, but then find tomorrow that nothing’s happened and call today’s activity a false alarm. Or you could take what’s happened today as fairly typical, and stay as far away as possible, unsure what might or might not happen. Hekla has in recent eruptions given ca. 1 – 1.5 hours warning of its going boom, which explains why ?Páll Einarsson is held in very high respect for managing to call the last one correctly, v shortly before it happened, with little more data or evidence than what we’re seeing now. She’s a floozy, madam Hekla, but we love her low down ways. http://www.livefromiceland.is/webcams/hekla/ The mountain in the center of the frame is hekla right? That’s right – a lovely volcano to watch even if she’s doing nothing. Also, if eruptions at Hekla start explosively is there a posibility of Pyroclastic flows, even if they are small? Yes, Hekla has produced both pyroclastic flows and base surges. The base surges was though far back in time. Hopefully no one gets hurt though. No, it will not happen now. Hekla changed about 1 000 years ago. I hope that you are having a grand time out on your “little” island. Have you ran into the guy who grows ducks out there? Hi Carl! It’s good to be back in the cafe. Is that Eye of Skye with the ducks? I’ve not met him yet, but there don’t seem to be many people who actually live here all year long so I’ll meet him soon I hope! Winter arrived today with snow on the mountains so I’ll have more time to sit indoors and volcano watch. Hoobs, when you added the spikes page of volcano webcams, I asked you if you could add Iceland’s volcanoes to it. I see they are still not added, can you let us know when you are adding them please, as some people who haven’t got access to a pc and only have tablets can’t access the webcams from the Mila site. It would be great for attracting more people to this site, who for various reasons don’t have pc’s but wish they could see the webcams of Iceland before the next eruption occurs. Thank you in advance and I know you must be busy. We are working on it. Hobbes is currently busy at work, but I am sure he will get around to it soon. Carl, can we have a link to the borehole strain page please, I’ve looked on IMO but can’t find it. /Link removed to save IMOs servers. We are working on mirroring IMOs Hekla-links. They will be up soon in here. Here is a site that will not stress IMO and has all the links for Hekla. Pull the drop down menu and find Hekla. I think Hekla is running towards an eruption. And let us laugh loudly about this sentence, because actually all active Icelandic volcanoes are indeed running preparing for an eruption, sooner or later, especially considering the current increase in hotspot activity that occurs every 120 years. Also all Icelandic volcanoes do this teasing. Let´s remember Katla. Now Hekla. Only reliable ones preparing for an eruption is actually Askja, with years of deep magmatic intrusions. Grimsvotn will eventually do its thing, and so will eventually Katla and Hekla, question is when. I AGREE FULLY with Carl explanation, that Hekla is also linked to SISZ, because we also saw an increase in earthquake activity in the eastern part of SISZ today. Hekla and SISZ and connected. As the plates move, the transform region reacts and so does Hekla. The thing is that, now for the first time, since 2000, we have really sensitive equipment to monitor Hekla, so as Carl article states, we might be actually seeing the run-up towards an eruption, and realizing that even Hekla actually is not asseismic as thought before. Today we were near an eruption. Eventually it will happen. I predict it comes within 2-3 months. Hekla often erupts in January-March period. I stand by that pattern and that by thought that Hekla is now fully ready to erupt. I think she will erupt in Jan-March 2017. There it goes, my wild risky bet. I will eat my hat if it doesn´t. Is there any theory/explanation as to why the January-March period is the risky one? Actually, and I can´t remember it now accurately but if you see the historical record of Hekla (and there are many eruptions with well known start date), you will find out that nearly all eruptions started in the first half of the year. And especially in a period around January to April. Why? I have no idea. It´s even bizzare. With Katla, a similar seasonal behavior is detected. Most eruptions starting (and even a peak in normal earthquake activity) around summer and early autumn, but in this case its meltwater that triggers the volcanic system. Supposedly. I look at other Icelandic volcanoes, but in them you dont find any seasonal tendencies. Just the late winter-spring tendency in Hekla and summer-early autumn in Katla. Also quake swarm at Esjufjoll today. A quite unknown volcano, perhaps the least understood active volcano in Iceland. But shallowness points to a tectonic event. Though the faulting is parallel to main rifting in Iceland, this is intraplate. I set up a page where all the Hekla data can be found. Many thanks for setting this page up. Really interesting (to me, at any rate) the way in which almost all the GPS stations except FED have been deflating recently. A revisit of the Hekla 2000 plot. This is the one that shows why the summit is a bad place to hang out. The quakes leading to that eruption were not human discernible until just a few minutes before it erupted. Seismo detectable quakes only started about an hour before showtime. It´s just a long rifting fissure at the top with steaming coming from it. Actually I never saw a volcano like that. A tall stratovolcano like mountain but actually a fissure on the top, and steaming. It was worth the risk to just see that unusual sight. Because other Icelandic volcanoes are either infrequent crater rows or fissures, but much smaller mountains than Hekla – so never looking like a rifting steaming fissure atop a tall volcanic mountain like Hekla- or otherwise impressive calderas with large geothermal fields, like Krafla, Torfajokull, Askja, or the ice-filled ones like Grimsvotn and Bardarbunga. All the quakes were minor but all at some depth (for instance the latest one is measured at 7.0km) . I keep watching with interest.